To debug programs on your target system, you must configure the µVision Debugger to interface to MON51. Under Options for Target — Debug make sure to select Use: Keil Monitor-51 Driver. Click on the Settings button to configure various parameters such as the COM port and baud rate. Comm Port Settings selects the PC COM port and the baudrate to use to connect to your target hardware. If you have problems connecting to your target hardware, try using 9600 baud. Sometimes non-standard baudrates allow different crystal frequencies on a target board without having to reinstall MON51. For example, a target board running at 12 MHz and 9600 baud can be modified to a 16MHz and 12800 baud by just exchanging the crystal. Cache Options speeds up the screen update. 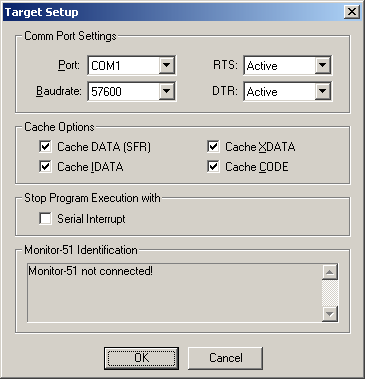 To view the actual value of port pins, timers or memory mapped external peripherals, switch off the cache for this memory area. For maximum performance, enable all caches. Stop Program Execution with allows you to use the serial interrupt of the 8051 UART to stop program execution. When Serial Interrupt is enabled, you can terminate a running application program with the Stop toolbar button or the ESC key in the Command page. If you use this option, the serial interface is no longer available to the user program, and your application must not reset the global Interrupt Enable (SFR Bit EA in IE.7).